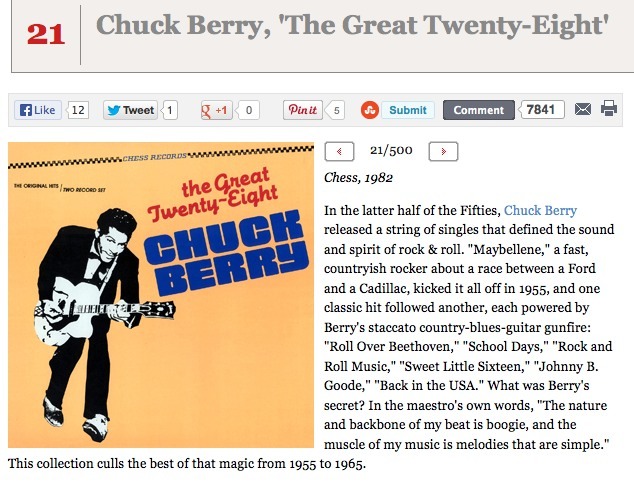 At number 21 in Rolling Stone Magazine’s 500 Greatest Albums is “The Great Twenty-Eight” by Chuck Berry. There is not much I can say about this album, as I have never heard it nor have I got round to streaming it. I should, and I will soon. I guess everyone knows how central a figure Chuck Berry was in the development of Rock ‘n’ Roll in the 1950s. I do not personally own a single song sung by Chuck Berry himself, but I am familiar with probably a dozen or more of his songs from the covers 1960s artists like The Beatles and The Rolling Stones did of his work. Also, his songs have become part of the “rock music” landscape. He was, of course, a major influence on most of the bands of the 1960s and beyond. If any of you heave heard this album then does it deserve to be number 21 on this all-time list? I saw him perform at Sussex University, mid-1960s. One of the two most charismatic people I have met, the other being John Paul II. One of the least charismatic people I have met (also Sussex, mid-1960s) was Eric Clapton. So it goes. Was Pope John Paul II on the same bill as Chuck Berry? Did they duet? Many of Chuck Berry’s records were recorded by the Chess Studios in Chicago. There is a compendium of the Chess Recordings that covers the period from 1947 to the mid-sixties. You can find it in on I-tunes and no doubt elsewhere. You will find it contains many of the originals subsequently made popular by white recording artists. Excellent! I’ll check that out. I’m familiar with Chess Records, my Muddy Waters and Sonny Boy Williamson records are on Chess Records.